A number of projects supported by Northern Ireland Screen’s Irish Language Broadcast Fund (ILBF) are set to broadcast on TG4 over the Christmas period. Ar Theallach an Dóchais, will broadcast for the first time on TG4 on Wednesday 19th December at 9.30pm. Set against the backdrop of the 50th anniversary of the Civil Rights Movement, the programme explores the state of civil rights in Northern Ireland today. Produced by Imagine Media Productions, Ar Theallach an Dóchais features six young advocates who work for change and examines the key issues which are motivating them today. The ‘Cabaret Craiceáilte’, an energetic, colourful and dynamic event at the heart of Irish language contemporary music, is considered to be one of the most important events in the Irish language world. Thanks to Sonas Productions, this year viewers can experience the 25th Cabaret from the comfort of their own home as An Cabaret Craiceáilte @ 25 broadcasts on Friday 28th December at 9:50pm. Set in west Donegal, An Bhuíon Cheoil looks at the love affair between the local community and the marching band. This one-hour film gets to the heart of the lives of band members and follows them as they take part in some of the major events in their annual calendar. With participants of all ages passionate to win the big competitions, the programme examines the commitment and longevity of the marching band tradition found within these small rural communities. Produced by Imagine Media Productions An Bhuíon Cheoil broadcasts on New Year’s Day at 7.30pm. The TG4 Christmas schedule will also feature a number of projects supported by the ILBF, which originally broadcast earlier this year. An Béal Bocht, an animated adaptation of Flann O’Brien’s only novel written in Irish, will air on Saturday 22nd December at 9.20pm. The film was produced by Pearse Moore and Tom Collins and animated by John McCloskey through their Nerve Centre based production company, Raw Nerve Productions. Hammond: Duais an Dorais examines the legacy of the creative talent, David Hammond, through contributions from friends, family, former colleagues, and archive footage of the man himself. The programme, which was produced as part of the inaugural Amharc documentary initiative by DoubleBand Films for BBC Northern Ireland and TG4, will broadcast on Boxing Day at 9.30pm on TG4. Pól Brennan uncovers the story of music collector Alan Lomax in Lomax in Éirinn on Wednesday 2nd January 2019 at 9.30pm. The documentary features exclusive musical performances from contemporary artists paying homage to the music that Lomax preserved, including Steve Earle, Clannad, Slow Moving Clouds, The Tulla Ceilí Band, Mississippi bluesman Sam Mosely and Nell Ní Chróinín. This year, Gradam Ceoil, broadcast live from Belfast’s Waterfront Hall, marking the first time the prestigious event took place in Ulster in its 21-year history. Known as the ‘Oscars of traditional music’, the spectacle can be enjoyed once again on New Year’s Eve at 8.30pm. Tá roinnt tionscadal a fuair tacaíocht ó Chiste Craoltóireachta Gaeilge Scáileán Thuaisceart Éireann le craoladh ar TG4 an Nollaig seo. Beidh Ar Theallach an Dóchais ar siúl don chéad uair ar TG4, Dé Céadaoin 19ú Nollaig ag 9.30i.n. Anois, agus cothrom 50 bliain ó bhunú Ghluaiseacht na gCeart Sibhialta, déanfaidh an scannán faisnéise fiosrú ar staid na gceart sibhialta i dTuaisceart Éireann inniu. Is léiriú de chuid Imagine Media é an clár agus déanann sé cuntas ar sheisear urlabhraithe óga a oibríonn le hathruithe a dhéanamh ar an tsaol agus amharcann an clár fosta ar na saincheisteanna móra atá á spreagadh anois. Is ócaid spleodrach agus fuinniúil é an ‘Cabaret Craiceáilte’ agus ócáid atá i gcroílár an borradh atá faoin gceol comhaimseartha i nGaeilge agus ceann de na himeachtaí is tábhachtaí agus is réabhlóidí i saol na Gaeilge. 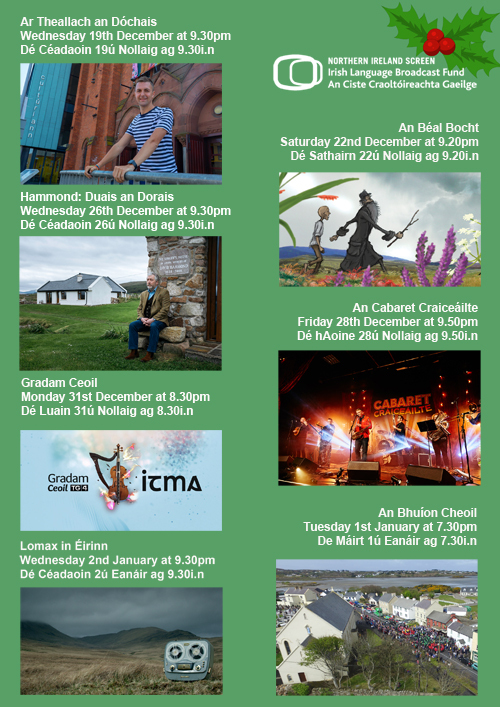 A bhuíochas do Sonas Productions, an Nollaig seo, is féidir leat amharc ar an 25ú Cabaret gan do tholg a fhágáil agus An Cabaret Craiceáilte @ 25 ar siúl ar TG4, Dé hAoine 28ú Nollaig ag 9.50i.n. Suite in iarthar Dhún na nGall, pléann An Bhuíon Cheoil an dlúthchaidreamh áitiúil atá ag an phobal leis an bhuíon mháirseáil. Tugann an scannán seo, a mhaireann uair a’chloig, léargas ar shaoil bhaill na mbuíon agus leantar iad nuair a ghlacann siad páirt i roinnt de na himeachtaí mhóra san fhéilire bliantúil. Bíonn an-dúil ag na rannpháirtithe uilig, idir óg agus aosta, leis na comórtais mhóra a bhaint agus fiosraíonn muid dlúthbhaint fhada na bpobal tuaithe seo le hoidhreacht na mbuíon mháirseála. Is leiriú de chuid Imagine Media Productions í An Bhuíon Cheoil a chraolfar ar 1 Eanáir ag 7.30i.n. Craolfar arís An Béal Bocht cóiriú beochana ar an t-aon úrscéal Gaeilge amháin a scríobh Flann O’Brien Dé Satharn 22ú Nollaig ag 9.20p.m. Beirt léiritheoirí áitiúla a léirigh an scannán mar atá, Pearse Moore agus Tom Collins, agus ba é John McCloskey a rinne an obair bheochana ina gcomhlacht léiriúcháin Raw Nerve Produtions sa Nerve Centre. Le hagallaimh le cairde, lena theaghlach, le hiar-chomhghleacaithe, agus le hábhair chartlainne, idir scannáin a rinne sé féin agus scannáin a rinneadh de, fiosróidh Hammond:Duais an Dorais tallann cruthaitheach agus tionchar leanúnach David Hammond. Léiríodh an clár seo mar chuid de thionscadal scannán ealaíne AMHARC. DoubleBand Films a léirigh é do BBC agus TG4 agus beidh sé ar siúl ar Lá Fhéile Stiofán ag 9.30i.n. ar TG4. Is é Pól Brennan (Clannad) a léiríonn scéal Alan Lomax dúinn i Lomax in Éirinn, Dé Céadaoin 2ú Eanáir 2019 ag 9.30i.n ar TG4. Sa chlár faisnéise seo déanann ceoltóirí an lae inniu a gcóiriú féin ar cheol a chaomhnaigh Lomax. Ina measc tá Steve Earle, Clannad, Slow Moving Clouds, Banna Céilí na Tulaí agus Nell Ní Chróinín. Don chéad uair i 21 bliain agus i stair an Gradam Ceoil, bhí an ócáid ar siúl i gCúige Uladh agus ag teacht beo ó Halla Cois Cuain i mBéal Feirste. Tá clú ar mar ‘Oscars’ an ceol traidisiúnta agus beidh daoine ábalta sult a bhaint as arís ag 8.30i.n. ar 31ú Nollaig.